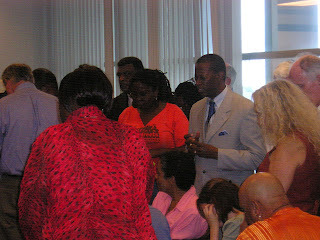 First, I'll get to some pictures from today's events. These are in chronological order. Leigh C. has the most accurate account (for my gelt) of what it felt like to be there. 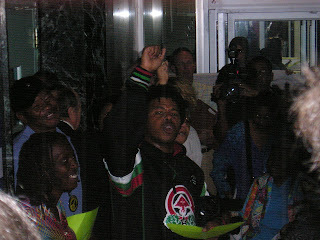 "Give us our homes, we'll be alright"
This guy with the hands was so annoyed. He sucked. Panel Curmudgeon on the right is realizing he won't be sleeping at night. 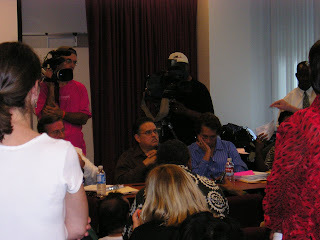 Panel Curmudgeon on the left has no soul. 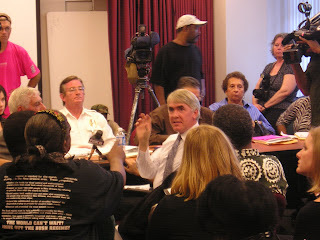 The Times Picayune report of this hearing describe it as "raucous" event in which public housing advocates are able to prevent the issuing of a demolition permit for the Lafitte project. 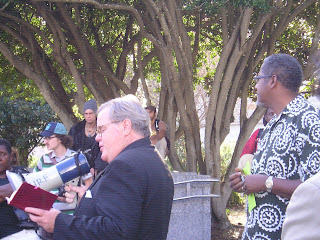 Yet, HANO has already promised to appeal the matter to City Council. 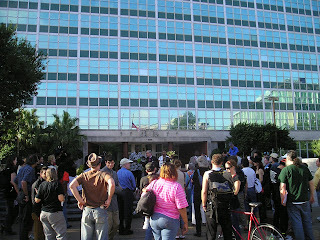 ...Saturday, Dec. 15th: Whomever is not yet in jail, protest at St. Bernard. Jump in Front of Bulldozers: Some cursory thought was given to Plan B. If the HCDRC approves the demolitions, these folks plan to send a message to those contracted to do the demolitions that they will be met with the same level of hysteria. They plan to stand in front of the bulldozers. Okay okay okay. They've got this loose plan in place to ratchet up the level of crisis in this city. I'm not sure if that strategy is currently sustainable. At around 10:00 or 10:15 AM, one demonstrator informed others about WWL's report linking their mobilization to a flier posted around City Hall and Duncan Plaza. 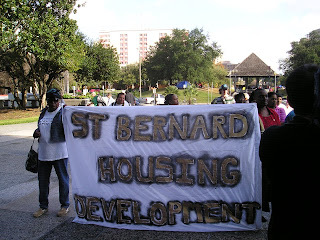 As tensions rise over the planned demolition of public housing units in New Orleans, some anti-demolition advocates are threatening more direct action. This poster is appearing in the CBD. How does this message make you feel? Are you more or less likely to support the anti-demolition position, or those making this threat? What should the government response be? Share your thoughts. I don't think adding the clause "or those making this threat" does a whole lot to that question other than clearly sway one against the "anti-demolition position". 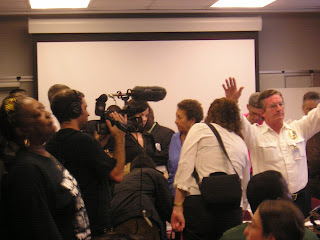 Then, immediately asking "what should the government response be" also biases a reader toward thoughts about appropriate government response to "the threats" of the "anti-demolition position" rather than the "threats" posed to the residents by HANO and the affordable housing crisis being ignored by politicians. Either way, this poster is the talk of town. Talk radio squawked on and on. It was the number one story at NOLA.com. But why are they targeting condos? Homes on tony St. Charles Avenue are way more expensive than most condos around here. It’s likely the threat applies to more than condos. The use of the word condos is probably a reference to the homes of the rich, New Orleans elite. But that’s just speculation. In any event, this flier – this terrorism, basically – is the latest example of the craziness that is unfolding in New Orleans as Saturday approaches, D-Day, the demolition day for public housing developments. The C.J. Peete, B.W. Cooper, Lafitte and St. Bernard complexes are among those slated to be torn down. Combined, the four total about 4,500 units. So that means 4,500 condos will be destroyed, according to the threat. The public housing debate has made New Orleans fecund ground for protests and threats of widespread arson. As D-Day day draws near, activists have become feverish. Some have threatened to chain themselves to public housing in an attempt to block the wrecking ball. 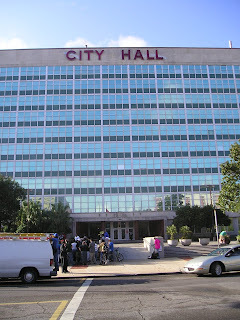 Last week, a civil rights lawyer was handcuffed at a City Hall meeting. 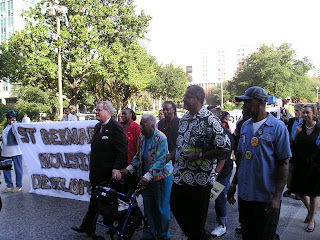 Over the weekend, public housing supporters staged a protest in front of Mayor Nagin’s home. And now this: arson. What’s next? As D-Day draws near, will City Hall be locked down? Will the bomb squad be on standby? There is no proof that the poster came from Quigley, Suber, or anyone else affiliated with the 100% peaceful mobilization at City Hall today, let alone the protest at Nagin's house and that in which Mr. Quigley, a white Civil Rights lawyer was arrested. It is much more likely that some misguided individual put up these posters acting for his or herself, expressing a level of outrage. The city is not blanketed with the fliers. To my knowledge, they were posted on polls only in the area immediately around City Hall. To me it is not too much more incendiary than someone advocating Revolution via a Ron Paul presidency or reading "Bush to the gallows" graffiti on a public bathroom wall. Yet Deon Roberts takes this opportunity to directly equate public housing residents and others who oppose immediate demolition to terrorists. Roberts actually claims a poster is an act of terrorism. "4500 condos will be destroyed! Arson?!?!? What's next?!?!?!? Bomb squads?!?!?!?" That's right, you heard it hear first. People that want to find solutions to the immediate affordable housing crisis in New Orleans before undertaking demolitions of public housing structures are stupid no good baby eating terrorists! They're going to bomb this whole city unless we all start letting them live in a house. My heavens! So I'm going to go ahead and say that it is an undeniable fact that the poster story was sensationalized by New Orleans mainstream media. The question is why? Why would the two primary establishment news sources and establishment talk radio be so keen on demonizing the legitimate, peaceful, and organized public housing protesters by inextricably linking them to a wanton violent threat that has not been proven to be even slightly credible? Why would the establishment want to do that? The sensational coverage of the poster thing has ratcheted up a counter-mobilization of racists and curmudgeon types, those that typically get tricked by these media feeding-frenzies and talk radio hose outrage. The cranky phone calls city officials and representatives get from these individuals will serve to counter the citizen advocacy on the part of the public housing advocates. Also sales of Depends and V8 will rise slightly. However, much of the population of "New" New Orleans is given to fits of senseless hysteria and will now openly arm itself against the threat presented by these posters. Now the demolitions will not only be cleared, they will be carried out without the least bit of remorse. Politicians will be able to further use the media to make the public housing advocates seem like a danger to ordinary New Orleans citizens. I am sure they are already on the horn with the FBI and DHS to prepare for some sort of attack from an unknown enemy that hates the freedom to have a condo. A politician will say something about these safety precautions in front of a camera, thereby reinforcing the supposed legitimacy of "the threat" and the supposed irrationality of the public housing crowd. The mass mobilization planned for Lafitte project in which protesters may or may not be considering blockading an I-10 ramp may be easily smashed given the "legitimate danger" and the citizen outrage. Future plans to physically occupy public homes slated for demolition seem more tenuous. It is imperative that organized advocates figure out a way to distance themselves from the flier. Some people smell a rat. If they could link it to a developer or big media or city gov't, that'd be enormous. Otherwise, they're going to have to figure out a hard-hitting symbolic tear-jerk gesture that might be able to win back some more sympathy from their media manipulated New Orleans neighbors. Today feels like a net loss. I'll still be standing with my neighbors. Go here for info as to how to help. It is interesting the female "curmudgeon" works with All Congregations TOgether, which is working with The Peter Claver Church, which is working with Providence Housing which is working on Lafitte. In another words she has a conflict of interest. I will have to admit that you tacitly approving of the poster advocating terrorism (because threatening to burn down a condo _is_ terrorism, by its very definition) does not help your cause, or your ability to sway others to your point of view. You probably had me on your side until that point. oh man. i thought i was pretty harsh on the poster. it's stupid. Jesus, jerry, where do you read "approval" of the poster in this entry? Just further proof that the stupid poster hardens people's reason receptors I suppose. A politician will say something about these safety precautions in front of a camera, thereby reinforcing the supposed legitimacy of "the threat" and the supposed irrationality of the public housing crowd. This morning on WWL radio Stacy Head was already on that "We have to take this treat seriously" kick. Heh That's "We have to take this threat seriously"
Treat... indeed. Or is that trick? Yeah, the curmudgeon on the right was female. And, from what Jeanne Nathan said to me yesterday, she is pretty much a tool. As a note, I am all for tearing down old public housing JUST AS SOON AS there are better places for everyone who needs it. Or if new, modern housing is being _immediately_ built where it sits. We may still disagree on the poster, though. I think that someone acting on that poster _would_ be a terrorist. Do you? The poster itself is then a potential threat of terrorism. Or is is a joke. If the poster had any hint of humor, then I would know it is a joke. Since it doesn't, I have to assume it was meant by an unfunny and serious and sober person. Now the question becomes: is is protected free speech, or is it a true threat, or is it inciting? A reasonable person (which I think I am) would probably conclude it is not meant as a true threat, but a clever piece of protest speech. No it was never rewritten, though I spent a long time futzing with the text size. Jeffrey, thanks for the info on Stacy Head's statements - they were obviously expected. Also thanks for yelling at Jerry kind of. It's not often somebody publicly does something stupider that Ray, but poster person certainly did. But again, the poster is a distraction, an excuse not to address the affordable housing crisis. It is being used to short-circuit attempts by advocates to force municipal government to address housing needs BEFORE demolishing housing units.